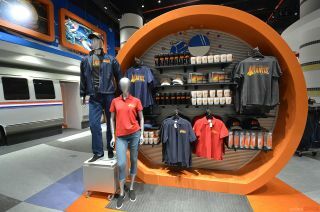 "Space Shuttle Atlantis" shirts, jackets, caps and mugs, among other souvenirs, are offered in the new "Shuttle Express" shop at NASA's Kennedy Space Center Visitor Complex in Florida. CAPE CANAVERAL, Fla. — It would not be a proper Florida theme park attraction if you didn't exit through the gift shop. But the souvenir station that awaits guests inside the new "Space Shuttle Atlantis" exhibit, opening Saturday (June 29) at NASA's Kennedy Space Center Visitor Complex, is not your typical trinket stand. The new Shuttle Express shop is helping to underwrite the preservation and presentation of a national treasure. Everything at the Kennedy Space Center Visitor Complex, including the "Space Shuttle Atlantis" exhibit, is funded by the proceeds that are generated by ticket, food and, yes, merchandise sales, which translates to having to sell a lot of t-shirts, patches and models. To encourage those sales, the Shuttle Express provides 4,000 square feet (372 square meters) for space shuttle and space-related souvenirs, which are displayed inside a playfully-laid-out retail space featuring children's artwork depicting their visions for the future of spaceflight. Of course, a souvenir shop is only as good as the items it sells and the visitor complex has produced a slew of new collectibles and gifts featuring Atlantis and the logo for the "Space Shuttle Atlantis" exhibit. Among the Shuttle Express' offerings are "Space Shuttle Atlantis" T-shirts, jackets and hats; cups and keychains; medallions and lapel pins. The pins alone are available in more than two dozen designs, each depicting the orbiter or other elements from the attraction. Space shuttle Atlantis, as displayed inside the new $100 million "Space Shuttle Atlantis" exhibit that opened Saturday, June 29, 2013, at NASA's Kennedy Space Center Visitor Complex in Florida. The exhibit's logo, which replaces the "A" in "Atlantis" with the silhouette of the shuttle, is also emblazoned on decals and license plate frames, as well as pocket watches and collectible spoons. One whole wall of the store is dedicated to embroidered patches, including the official mission emblems for all 135 shuttle flights. One of the patches in particular, an 8-inch (20 centimeters) badge, was created for the exhibit to honor all 33 of Atlantis' missions. The "The Voyages of Atlantis" emblem was designed by local artist Tim Gagnon, who, in addition to designing the patches for other shuttle and International Space Station crews, worked with Atlantis' third-to-last crew to create the official STS-129 mission insignia. "This fully embroidered patch celebrates every mission of the shuttle Atlantis," Gagnon wrote about his design. "The central focus is the launches of Atlantis as it'll be forever displayed at its home port, the Kennedy Space Center." The emblem, which features the "Space Shuttle Atlantis" logo at its bottom, includes "iconic scenes and payloads" associated with the retired orbiter's 26-year history, said Gagnon, and includes 33 stars and 10 international flags representing each of Atlantis' missions and the countries represented by its crew members. Space shuttle Atlantis models, including a limited edition model signed by Atlantis' final commander Chris Ferguson, are offered by the Kennedy Space Center Visitor Complex in Florida. Another collectible created for the exhibit recreates the unique way in which Atlantis is displayed and involves the orbiter's final mission commander. Unlike NASA's other orbiters, which, at least for now, are all displayed horizontally on or near the ground, Atlantis is mounted high in the air and steeply angled to one side. The orbiter's payload bay doors have also been opened. The result is an exhibit that evokes how Atlantis appeared when it was in orbit, a view that was previously limited to astronauts in space. That scene is captured in miniature by a new 1:100 scale model of Atlantis produced by Toys & Models Corporation for the visitor complex. The orbiter models are mounted on a base at the same 43.21 degree angle as the full-scale Atlantis is now displayed. The 14.5-inch-long (37-centimeter) mahogany models also feature payload bay doors that open. Limited to 135 individually-numbered pieces, each has the "Space Shuttle Atlantis" logo and a descriptive plaque on its base. The metal plaques are authentically signed by former NASA astronaut Chris Ferguson, who commanded STS-135, the last flight of Atlantis and the final mission of the space shuttle program.